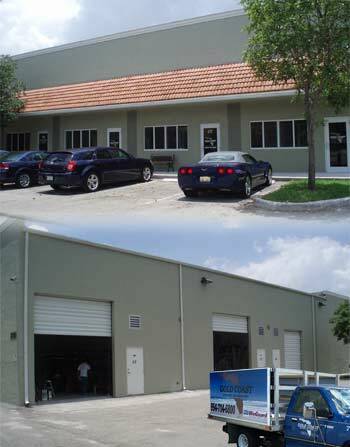 Gold Coast Windows & Doors is headquartered in the heart of Fort Lauderdale, Florida in a 4,000 square foot building that houses our business office, factory showroom, and warehouse. We utilize a dedicated in-house team of window and door experts who specialize in Commercial, High Rise, Mid Rise, and Residential window and door replacements and installations. Our owners, Don Foster (President) and Danny Gothelf (Vice President), began the company in 1998 when they combined their more than 100 years of experience in an effort to bring customers the highest quality of materials and workmanship for every window and door project. Right from your initial contact, you'll see that it is important to us to provide exceptional customer service and to get the job done right the first time. Because we pay particular attention to details, all of our products have been Metro Dade County tested and approved for both large and small missile impact. In addition, all of our products will give you the highest of design pressures for that extra measure of safety. We are proud to operate our company with integrity and we are fully licensed and insured. Find out why so many residents and business owners on Florida's East and West Coasts trust us for all of their window and door needs. Visit our factory showroom or let our design professionals meet with you to discuss and plan your next project. Call us at 954-714-6800 or contact us online now for an in-depth consultation. Our prices are competitive and we offer free estimates.